Get the little ones in the game with this soft fine jersey football one-piece. Your little athlete will be the sportiest one in town in this outfit. We're not calling it a onesie anymore, we're calling it an infant football bodysuit! Coverstitch front and back yoke. NOTE: there is a seam stretching across the back shoulders of this item. We cannot decorate over the seam. Please do not position your design objects on top of the seam. As a Football-style bodysuit, this bodysuit is great for Name & Number designs. On the back, the name should be fully above the seam, and the number should be fully below it. We little hooligan! 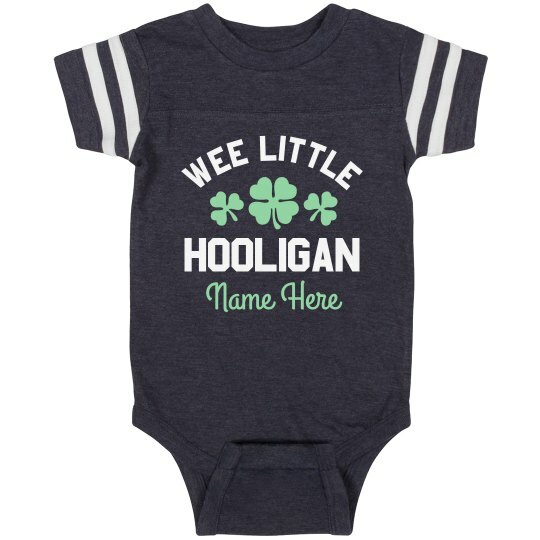 Customize an adorable green onesie for your baby to rock this St. Patrick's Day. Make sure their 100% pinch proof in this festive shamrock outfit.